When the call went out on Facebook, I jumped at the chance to join Gordon’s final getaway and ignored all other relevant information. Like I was recovering from manflu, coughing like a pack-a-day smoker and I’d never actually ridden 150km before. Whatever, I like to ride my bike, I haven’t seen a proper hill for months, who needs facts. Off we set to KL on a luxury coach. From the planned group of travelers, we lost one before the bus even left (Shanniz Irmana realized her passport wasn’t in Singapore), lost another at the Singapore border (Liam Winston brought the wrong passport and couldn’t exit the country) but luckily Malaysian immigration were extra-lax that day and Hooper got through with his passport which expired in less than 6 months. After all the border excitement it was a mostly uneventful journey and we reached KL in time for pizza, beer towers and street noodles. Day 1 we rolled out 8am sharp with both a lead-out-car and a sag wagon with spares, snacks and hydration (impressive). The group rolled out at a gentle pace and got 3km down the road when Julie Kenny felt sick, realized her HR monitor was giving her the max HR readout of a 30 year old and decided to climb in the van and head back to the hotel pool. 15km later we hit our first climb, Jalan Hutu Langat a 4% climb over 3km, it split the group and we all tapped up at our own pace (except the fast boys, who probably raced each other to the top) and then the descent…. Ahhhhhhh, I’ve missed descending. This trip had lovely winding roads and sweet, sweet descents. Next up was Bukit Hantu a 3.4km climb with some nasty 10% pinches, I found by this stage Howard Wallis and Jelte Waardenburg climbed at my pace and I was thankful for the company, with us all pulling turns uphill before I guiltlessly abandoned them downhill to descend at my own pace (wheeeeeeeeeeee…..). I didn’t know the route (I never do) but it worked out perfectly, with all T-junctions located at the bottom of hills, I could stop and wait for Howard and Jelte to tell me which way to turn and we would roll in the correct direction together. At about 40kms, we caught up to Steven Wong who had generously punctured in front of picturesque Seminyeh Dam so we stopped for an early break. Phil Morris helped Steven with the puncture while the rest of us took photos of the view and drank 100 plus from our van in the name of moral support. Onwards and upwards towards Genting Perez aka “the hill that never ends”, a 9km climb. After that it’s all a bit of a delightful climbing and descending blur, until we stopped for lunch at 70km where a group of 10 ANZA boys had stopped at a kampong coffee shop and had been trying to order lime juice from the proprietor who spoke no English. Instead they ended up with “only 2 large bottles of beers” which very quickly turned into 5 bottles as we tried to figure out where the other half of the group went. Probably lost. Apparently this happens all the time. While we messaged the missing riders I used my poor Chinese language skills to order the only food the shop sold, noodles. Turns out everyone else had turned left instead of right (taking them up more hills) and were on their way. Except Steven who by this stage had punctured 3 times and turned back, and Andrew Purcell who never found us, completed the route in reverse and allegedly loves it solo. Our riders arrived but the noodles didn’t, apparently there had been a misunderstanding and so I ordered more noodles and we waited. And waited. Megan, Laura and Gillian decided to get a head start and set-off. By the time we finally got our food the first group had been hanging around for 2 hours and were ready to leave, so we hoovered up what we could and hit the road. We left in a single group until the next set of climbs. It was at halfway through these, after a brief regroup my legs turned to lead. Howard and I tackled the next set of climbs together, along with Raoul Berthillon who had obviously taken pity on me and vainly tried to tow me along. A sweet descent down Genting Perez, the whole team regrouped down the bottom and I thought we were done with the climbs. Only we weren’t. There was one left and it was 4km on a steep, bumpy main road with high traffic and large trucks. Climbing it I had head-spins and was overtaken by just about everybody. I daydreamed of getting in the sag wagon whilst keeping my legs spinning. 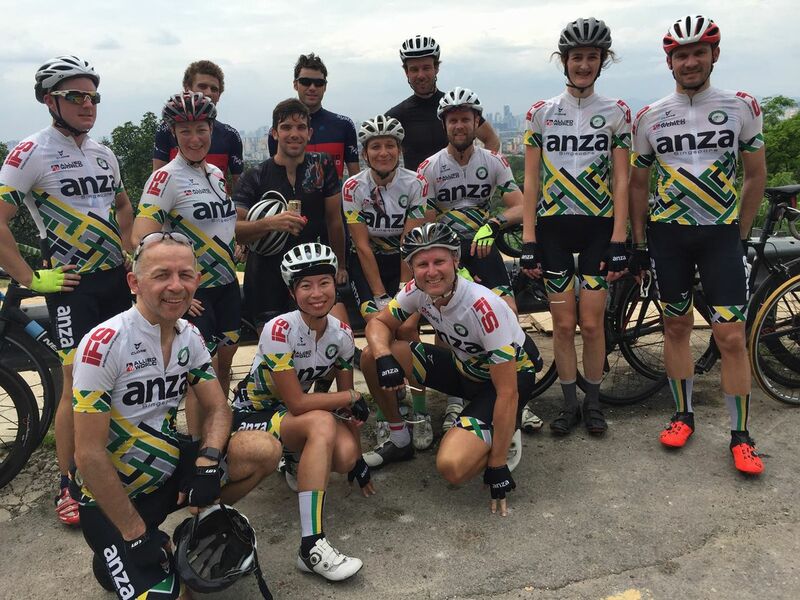 Last climb done, we were treated to a hazy look-out view of KL and as much cold watermelon as we could eat from the sag wagon. We rode slowly back to KL as one group, 18 riders, 146km and 1965m of climbing, we celebrated with G&Ts in the pool. Before our feet turned into swim feet, we went up to the club lounge (thanks Mark GM Park Royal) to enjoy some finger food, beers, wine, Jack & cokes (followed by jack without cokes). Time flies in good company, and before we knew it, we had to rush over to the Italian restaurant that Mr. Kinder had arranged for us. We entered Ristorante Michelangelo in same style as a bunch of teenagers high on booze and hormones, probably to the other guest’s exasperation. We split up into two tables, which soon turned out to become the two competing teams for the next day. My team, “Team Tinder Surprise”, was enjoying great wine picked by our in-house expert Monsieur Berthillon, while discussing different dating techniques, ping-pong games in Phuket and also a bit of tactics for the next day’s championship. The table next to us on the other hand seemed to have totally forgotten about tomorrow, and looked more like a company outing from an Irish brewery than athletes on tour. Dinner was followed by numerous “last drink” at a Mexican place. At midnight some of us had enough and went home while the party animals stayed to give KL some ANZA foot prints. The next morning turned out to be very interesting, where some of us needed input from others in order to figure out exactly what happened between “bar Loco” and bed time. I happened to share elevator with one of our experienced cyclists, who could reveal that she didn’t know how she got home, and that she surprisingly woke up with her clothes on – anyways, in true ANZA spirit, she was ready for the leg killing 15k climb of the day on our 70km mountain route. 8 am sharp (when we had agreed to be ready for departure), Team Leader Ms. Gordon sat ready in the lobby together with Team Early Birds, consisting of TDF veteran Raoul, James Bond, the Cervello rocket and our soon-to-be globe trotter Gillian. Meanwhile, the rest of us were pumping tires, having breakfast and getting dressed, probably all of it at the same time. It didn’t take long before all of us (except the two guys who won the banquet the day before) were ready for departure. We sent a squad of our loudest people to try to get these snoozers out of bed, but in vain. We simply had to leave them behind. We all know that Victor and Hoops are great climbers, so maybe they didn’t need the training as much as the rest of us. For what I know, Hoops maybe even logged some distance on his Strava from yesterday’s motorbike pillion ride through the narrow back streets of KL. It was a nice and sunny morning with a cool breeze swiping through the city as we navigated our way through the somewhat heavy traffic towards the mountains. We stick together as a team, warned each other for bumps, holes and crazy drivers, bearing in mind that as soon as we would reach the hills, our team spirit would probably go down the drain as our hill climbing ego would kick in. We made a quick stop just before the incline started, but it wasn’t quick enough for some of us. The Duracell Rabbit Adam disappeared before anyone had time to react, soon followed by Mike, Mr. Iron Man (Trent) a couple of others including myself. It was a tough 15k climb were chit-chat was replaced by complete silence under strong influence of lactic acid. Just when I thought that this couldn’t possibly get any worse, a 20 knots head wind turned up (thanks for that Mother Nature). Fighting up the hills I could hear Whitney Houston singing “I will always love you” – and I started to wonder if I had pushed myself so hard that I was on my way to die and that this was the start of the journey to heaven (Maybe Led Zeppelins “stairway to heaven” would have been a better choice? ).. A few corners later I was back at planet earth, when I discovered that it was just a MTB cyclist who was spreading love from a stereo in his back pack. Maybe AC/DC would have been what I needed, but creds to the dude for bringing some tunes to the hills from hell. We had a great stop at the windy summit, getting fruit, soda, water and coffee from the back of a couple of cars. Some photos were taken, some stories were told and then we headed back where we came from. Now it was not a matter of stamina anymore, but just who had the biggest balls. Miss Gordon (who I believe doesn’t have any balls) took a head start down the hills. I think this was my favorite part of the trip. High speeds, a lot of trees to dodge and cars to try to overtake. The hills ended in a quite long straight with a slightly negative incline – a smooth high speed part with the hands on the lower part of the handle bar (wohooo!). We re-fueled at a mini market and headed back to the hotel in a big group. Just before we reached, Scott, Trent, Laura and I headed to Petronas towers for some selfies! To our surprise, that was apparently prohibited?! Some security guards were whistling at us and telling us that it was not allowed to cycle inside the park. “OK, so we get off our bikes then” – “No, cannot have bicycles here”. We pretended to be deaf and managed to get a couple of shots (camera shots) before we were kicked out. Back at the hotel we had a few hours for showers, packing and lunch before we had to get on the bus back to Singapore. It was a tired bunch of ANZAs on our way back, but just as on the school trips, the students at the back of the bus were going strong. We had great fun playing games all the way back to Singapore. Wrapping up this tour report, I (and Steph) would like to take the opportunity to thank Laura Gordon for arranging Gordon’s getaway. It was my first trip with ANZA and I’m very impressed by how well organized everything was and how smooth everything went. For those who might read this, I can highly recommend attending the next ANZA trip. For me, this was a great opportunity to get to know the other team riders that I meet on our weekly rides here in Singapore, not to mention all the new people that ride in other groups. We share the passion for the same sport and I think that contributes to how well we get along and how much fun we’re having. Can’t wait till next time!